Clutch is basically a mediator between engine and gearbox. It helps to achieve smooth gear shifting. It also transmits all those horses which the engine produces, to drive wheels. The clutch keeps the power running smoothly from the engine to drive wheels. The slipper clutch is a different type of clutch. 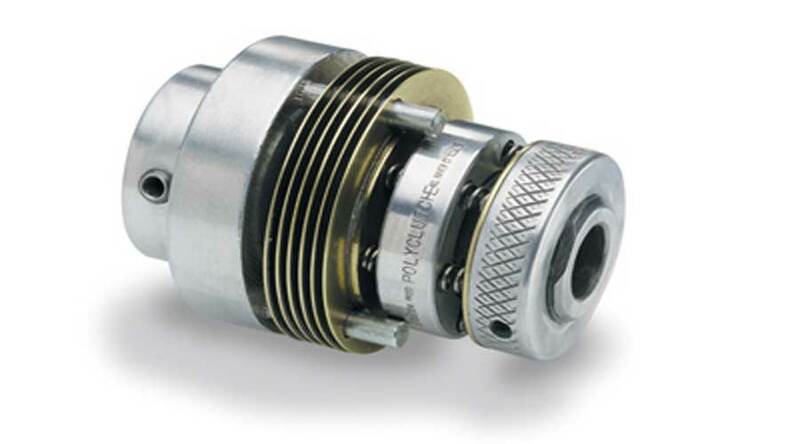 It is mostly utilized in the race-track motorcycles. It helps to reduce the speed abruptly without losing traction of the rear wheel. This functionality is useful during emergency braking. Normally, on a motorcycle when the throttle is opened the engine starts transmitting the power to the rear wheels via drivetrain. When the rider closes the throttle, the engine stops powering the rear wheel. As the throttle is closed, the rear wheel in motion controls the movement of the pistons in the engine via drivetrain. As you down-shift, the speed of rear wheel exceeds the speed of the engine. The resulting torque creates an immense amount of stress on the bike's swingarm, chain, rear sprocket and rear wheel. This sudden backdrop of the engine torque is more prominent in case of a four-stroke engine with high power output. This sudden backdrop of torque during emergency braking may result in loss of traction of the rear wheel which may cause skidding. The wheel may hop and in some rare cases, total locking of rear wheels can take place resulting in fatal accidents. It is especially very dangerous during cornering. The slipper clutch comes into play in such scenario. It makes the downshifts more flawless and smooth and absorbs most of the backdrop torque. This results in safe & smooth emergency braking. So, when the rider is riding at high speed, he/she can easily downshift and control the motorcycle without losing traction on the rear wheel. How does Slipper Clutch work? 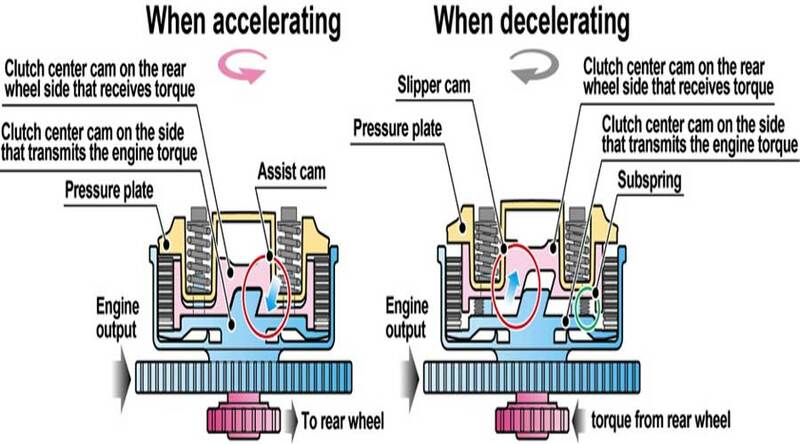 When you engage the conventional clutch, its primary function is to transmit the torque via the transmission. Slipper clutch works exactly the same way. The only difference is, it disengages when met with a certain level of back torque thereby, transmitting this back torque away from the engine. Then it engages again and the cycle continues until it achieves neutrality between the forces of the rear wheel and the engine. It absorbs all the back torque when it disengages. This peculiar feature of this type of clutch avoids losing traction of the rear wheels. This particular scenario can be controlled in normal clutches as well, but it requires skill. Blipping during heavy downshifting results into same functionality, but it requires experience and skill. In emergency situations, the rider may lose his concentration and lose control. Why you need a slipper clutch? Basically, race-track motorcycles use it as it helps to gain faster lap times. The rider can easily coordinate the speed and braking without losing traction. But considering the safety of the rider at high speeds, many manufacturers today have widely adopted the slipper clutch. Riding safety is a major advantage of the slipper clutch. Undoubtedly, safety will be the priority of everyone out there on two wheels. Slipper clutches are not easy to manufacture and come with a high cost. However, it largely depends on your skill, whether you should go for them or not. However, they will surely add to your safety. Here is the video explaining how it works from National Geographic. Home » Technical Anatomy » How A Slipper Clutch works and why do you really need one? What is FTIS – Fully Transistorised Ignition System? What is Drive By Wire Technology in cars and How it works? Know More. What is Brake Assist (BA/BAS) in a car ? Active Safety System Vs Passive Safety System – What is the difference? What is MCi-5 Engine Technology by Mahindra? What is Tesla autopilot & how it works? Motorcycle Stability Control (MSC): How does it help while riding a bike?